The following are explanations for our posted boil water notices. Boil water orders and clearances are posted on this page and the main water and utilities page. 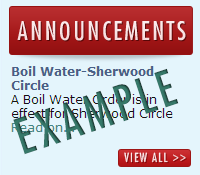 You will know that there is a boil water notice when you see an announcement (see example) on the right hand side of the page (light blue section). The order or clearence will have all necessary information about the boil water notice. You can also go here to see if there are any current notices. Should you ever have a question about a boil water notice please do not hesitate to call. Restaurants with questions regarding a boil water notice can refer to this document provided by the Florida Department of Business Professional Regulation. Due to a water main break in your area, we advise you to boil all drinking and cooking water as a precautionary measure. Water should be boiled at a roaring boil for a period of no less than 3 minutes. This order is in effect beginning immediately and continuing for a period of no less than 48 hours. Standard bacteriological testing of the water main is currently underway. The bacteriological sampling and testing is now complete. The tests indicate the water is safe for drinking and cooking without boiling. If you have any questions please call Billing and Customer Service at 561-741-2300, Monday-Thursday 7:30am-5:30pm & Friday 8:00am-5:00pm, or if you have an emergency call 561-741-2609.